I travel between Oregon and Washington frequently and like to stop in Portland dispensaries (also available recreationally for adults 21+) and stick my nose in some of their most fragrant buds and edibles. 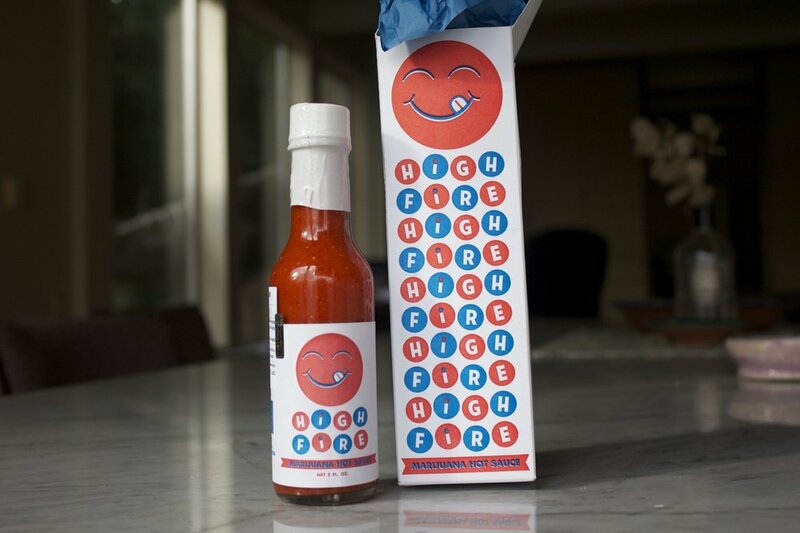 I had been dying to try some High Fire infused hot sauce for awhile because, hello, the two best things combined ever. Finally a few weeks ago I was able to score some and couldn’t wait to get back to where I was crashing to try it out. The ingredients in the sauce are super simple — habanero peppers, tomatoes, and THC-infused coconut oil. The best part about this hot sauce is the taste of it, because let’s be real, if it tastes bad, we aren’t gonna want to ruin the taste of the meal we’re about to smash. Luckily this sauce tastes super fresh and naturally flavorful due to the balance of different tastes. Also, it was actually HOT — like ethnic spicy awesomeness that made my nose sweat with each big bite. There is about 415 mg of THC in each bottle which works out to about 14 mg per teaspoon, meaning that you are not consuming this product expecting to get super stoned off it, especially if you have a fairly high tolerance. Rather this is designed to be more of a boost to your (most likely) already existent high.